With approximately 5,000 zones set up in 130 countries, special economic zones (SEZ)—geographically-bounded areas in which customs, tax and investment regulations are more liberal than in the rest of the country (Farole and Akinci 2011)—are one of the most important instruments of industrial policy used by developing countries around the world. Firms located in these zones are often subject to export share requirements (ESR). That is, they must export at least a certain share of their output to be eligible to operate and enjoy the generous fiscal incentives available in SEZ (Defever and Riaño 2017). The imposition of ESR, therefore, makes the subsidies provided to firms in SEZ contingent upon export performance—a practice prohibited by the World Trade Organization's (WTO) Agreement on Subsidies and Countervailing Measures. How does making SEZ compliant with WTO subsidy disciplines affect export performance? In recent research (Defever et al. 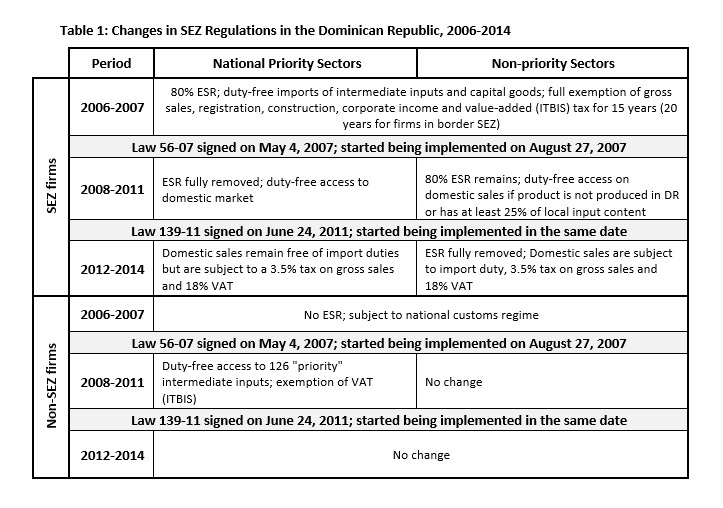 forthcoming), we seek to answer this question by investigating the reforms undertook by the Dominican Republic, which eliminated the export share requirements from its SEZ during the last decade. The Dominican Republic is widely considered a long-standing referent in the successful use of SEZ, a policy that has been in place for more than four decades (Bergaud and Farole 2011). SEZ are tremendously important for the Dominican economy—in 2015 they accounted for approximately 50% of total exports, as well as 3% of GDP and 4% of employment. At the same time, the World Bank (2014) estimates that that the value of tax breaks offered to companies based in SEZ companies stands at approximately 540 million US dollars, or 0.9% of GDP—a substantial cost in terms of foregone government revenue. In our paper we take advantage of the staggered elimination of ESR across products and over time in Dominican SEZ to investigate their effect on exports. Before 2007 all firms located in SEZ had to export at least 80% of their output. The first wave of reform implemented in August 2007 (Law 56-07), eliminated ESR only for SEZ firms producing leather, textiles and apparel and footwear products—the so called “national priority” sectors—while in June 2011, Law 139-11 lifted the ESR for all firms in SEZ regardless of their sector of operation. In both waves of reform, the level of fiscal incentives made available to firms in SEZ remain unchanged, although firms in priority sectors located outside the zones were extended some of the benefits available to producers in SEZ (see Table 1 for a description of the changes to the SEZ regulations between 2006 and 2014, our period of study). Our theoretical framework offers two predictions regarding the consequences of the elimination of export requirements in SEZ. Firstly, removing the distortion that prevents firms from selling their output domestically—while the fiscal incentives of locating in SEZ remain unchanged—induces firms (both new ones and firms formerly operating under the national customs regime) to locate in SEZ. Secondly, the reform has an ambiguous effect on the volume of exports originating from SEZ. This is the case because while new entry into the zones increases exports, there is also a subset of SEZ firms which were constrained by the ESR; exports of these firms fall as they relocate some of their output to the domestic market. We use data from the universe of customs transaction from the period 2006 to 2014 to test these predictions. We find that, within narrowly-defined products, the removal of ESR led to an increase in the share of exporters based in SEZ by 6.2 percentage points compared to before the reform; the share of export value accounted for by SEZ, on the other hand, was not significantly affected by the policy change. At the firm-level, we find a positive effect of the reform on the probability of new exporters based in SEZ. Among firms that were in the SEZ prior to the reform, we see that the probability of exporting new products increases after the reform, but at the same time there is a large drop in the average value of exports. Our main conclusion is that making the Dominican SEZ compliant with WTO rules, made them more attractive locations to export from, but without significantly increasing the value of export originating from SEZ or from the country. Although our analysis has focused on the response of exports to the removal of ESR at the microeconomic level, it is likely that the reform of SEZ also had important macroeconomic implications for the Dominican Republic. On the one hand, our findings suggest that the already substantial fiscal cost of the SEZ regime is likely to have increased after the reform—without having achieved a significant increase in aggregate exports. On the other hand, the general equilibrium analysis of the use of subsidies subject to ESR (Defever and Riaño 2017) shows that removing this distortion has the potential to deliver substantial welfare gains—particularly if many firms were constrained by the export requirement—as our results suggest. It is also possible that fostering entry of local firms into SEZ could also boost the diffusion of knowledge spillovers originating from large exporters based in the zones. 1. See General Council decision of July 31, 2007 WT/L/691. The temporary exemption from the ASCM for certain subsidy programs is stated in Article 27.4. The other countries that benefited from this exemption, in addition to the Dominican Republic, were Antigua and Barbuda, Barbados, Belize, Costa Rica, Dominica, El Salvador, Fiji, Grenada, Guatemala, Jamaica, Jordan, Mauritius, Panama, Papua New Guinea, St. Kitts and Nevis, St. Lucia, Saint Vincent and the Grenadines, and Uruguay. Burgaud, J.-M. and T. Farole (2011): “When Trade Preferences and Tax Breaks are no Longer Enough: The Challenges of Adjustment in the Dominican Republic’s Free Zones," in: Special Economic Zones: Progress, Emerging Challenges and Future Directions, ed. by T. Farole and G. Akinci, World Bank. Defever, F., J.-D. Reyes, A. Riaño, and M. E. Sánchez-Martín (forthcoming): “Special Economic Zones and WTO Compliance: Evidence from the Dominican Republic," Economica. Defever, F. and A. Riaño (2017): “Subsidies with export share requirements in China," Journal of Development Economics, 126, 33-51. Farole, T. and G. Akinci (2011): Special Economic Zones: Progress, Emerging Challenges and Future Directions, Washington DC: The World Bank. World Bank (2014): How to Sustain Export Dynamism by Reducing Duality in the Dominican Republic, Washington, DC: World Bank.